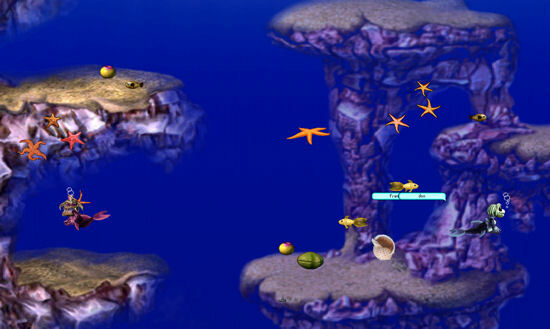 The Albian Sea Bay aka The Amazing Virtual Sea-Monkeys to C2 is an underwater world for Creatures 2. NornenMeister has converted a tank from the The Amazing Virtual Sea-Monkeys for this world. The world consists of sixty-six new rooms. There are lots of fishes, corals, starfishes and so on. In addition there are included an Ettin/Mernorn Spritemix (Sea Ettins) and a Grendel/Mernorn Spritemix (Sea Grendels) in the installation files in order to enable you to play with swimming Ettins and Grendels. This world also runs under The Albian Years. The Albian Sea Bay has been released September, 11th, 2007 and can be found at Mummy's Creatures. This page was last modified on 14 August 2017, at 13:49.